Snowy oaks, Yosemite. 1/125th of a second at f/11, 800 ISO, 150mm. On Wednesday Claudia and I were in Yosemite Valley during a snowstorm. 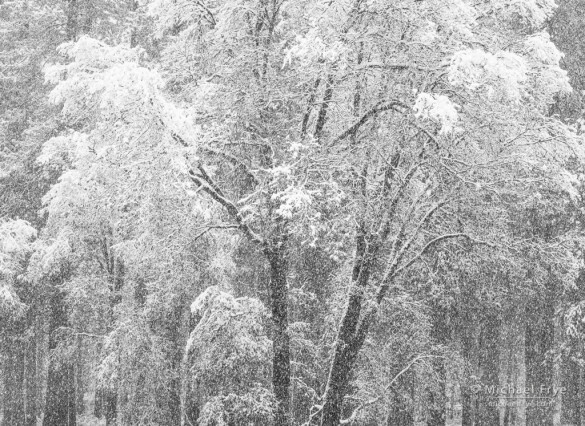 At times the snow was heavy, and wet, with big, fat flakes falling. It’s difficult to keep the camera dry and prevent water drops from getting on the lens under those conditions, but if you can manage that stuff you can find some beautiful scenes. The falling snow thickens the atmosphere, creating a fog-like effect, and the falling flakes themselves add to the snowy mood. When it’s raining or snowing a lens hood is essential to keep water drops off the front glass. You also need to constantly check the front of the lens to make sure it’s clean, because it’s hard to see the drops through the viewfinder, but they become glaringly obvious later when looking at the images on a big screen, and are often impossible to clone out or otherwise fix. Telephoto lenses have longer hoods, which are better for keeping the front glass dry; all the photos here except one were made with my 70-200mm zoom. There are many specialized camera rain covers on the market, but I often find them poorly designed and hard to use. I used an old gaiter to cover the camera for these images. A spare rain jacket also works well: you can put the hood over the camera, and tie the sleeves around the tripod underneath the head. A plastic bag will work in a pinch. 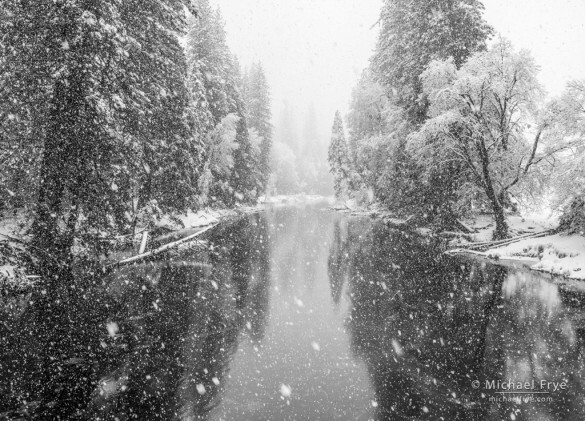 The snowflakes themselves will only show up against a dark background, so I looked for compositions with dark tree trunks, or in one case, the dark water of the Merced River. The shutter speed has a big effect on the appearance of the snowflakes. A fast shutter speed, like 1/125th of a second or higher, will freeze them and make them look like little dots. Slower shutter speeds turn them into streaks (around 1/15th of a second worked well on this day with little wind, but something around 1/30th to 1/60th might be better when the snow is blowing sideways). I tried a variety of shutter speeds for every composition, because it was hard to tell which I liked better at the time, and I wanted to have choices later. As you can see, in most cases I ended up liking the fast-shutter-speed pointillist effect better, but there were a few times when the softer, streaked look seemed to fit the image. More distance between the camera and subject meant more snowflakes in between, and a softer, mistier appearance. If I was standing in the open there were snowflakes right in front of the lens, and with a fast shutter speed these became large, out-of-focus blobs. 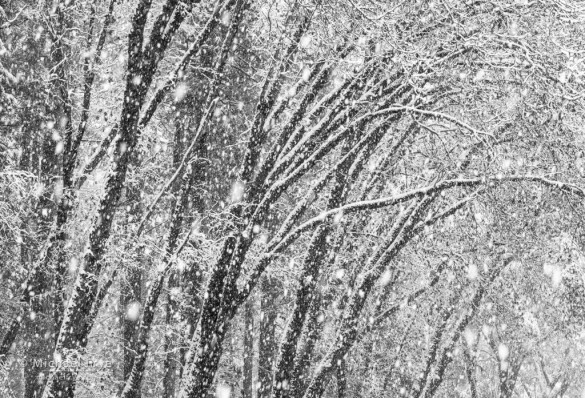 I usually liked the dalmatian-like appearance these created, but I found that if I stood underneath a tree canopy, where fewer flakes were falling, I could avoid those out-of-focus blobs, leaving only a pattern of small dots, as in the last image below. Most of these photographs were obvious candidates for a black-and-white conversion, since there was little color. The snowy, misty scenes had a natural high-key look, so I kept that and even exaggerated it in processing the images, keeping them light but not washed out. I found that adjusting Clarity had a big effect on the look and feeling of the photographs. For images with fast shutter speeds, I often used a moderate to high amount of Clarity, which brought out the patterns of the polka-dot snowflakes. (That much Clarity makes most images look too harsh for my taste, but it worked for these super-soft photographs.) For images with slow shutter speeds I sometimes used a small amount of negative Clarity, which helped add to the soft, misty feeling. My gloves eventually got soaked, and my hands started getting cold, so I packed it in, but despite being cold and wet I thoroughly enjoyed the day. It’s been awhile since I’d photographed during a snowstorm – after all, there haven’t been many snowstorms here over the last four years – and I’d forgotten how much fun it can be. I hope to get more chances soon. P.S. As I said, it’s been awhile, but this isn’t the first time I’ve photographed trees during a snowstorm. You can see more examples here and here. And at the end, below, you’ll find a slow-motion video that Claudia made of me photographing in the snow. 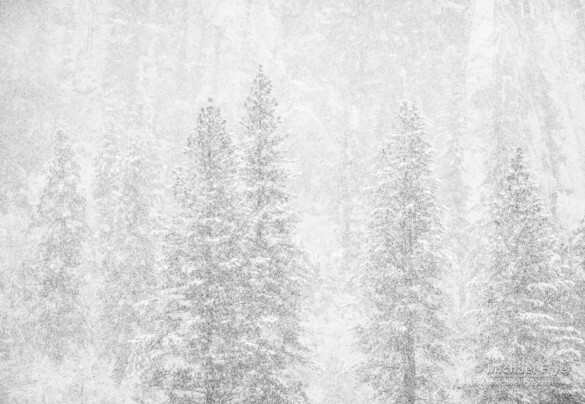 Oak and pines in snowstorm, Yosemite. 1/125th of a second at f/8, 1250 ISO, 106mm. Oaks and falling snow, Yosemite. 1/15th of a second at f/11, 200 ISO, 173mm. 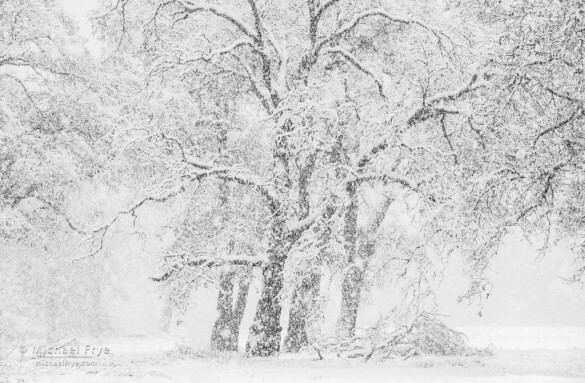 Oak trees in a snowstorm, Yosemite. 1/125th of a second at f/11, 1000 ISO, 78mm. Oaks, cedars, and falling snow, Yosemite. 1/15th of a second at f/11, 160 ISO, 70mm. Oak tree with falling snow, Yosemite. 1/125th of a second at f/11, 640 ISO, 70mm. 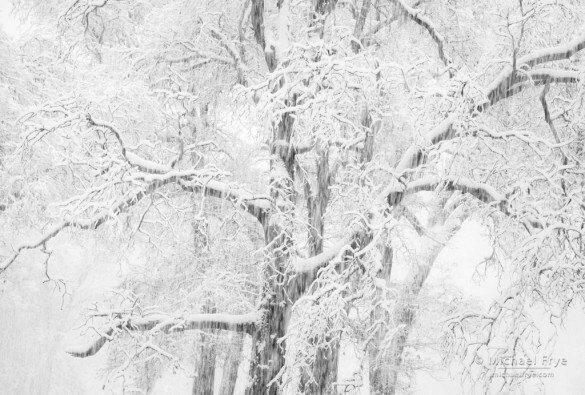 In the Snow from Michael Frye on Vimeo. Great shots Michael! I can’t wait to get back up there during winter. Great seeing you and Claudia. Thanks Mike! It was great seeing you and Veronica, and I hope you got some images you like. 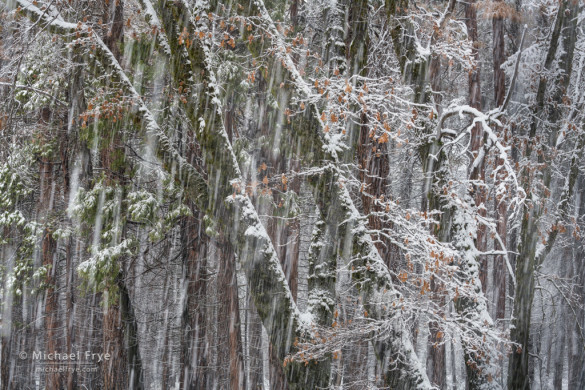 Love these shots – always enjoy the quiet of the snow and the magic it creates and it is most impressive in Yosemite! You capture the feeling! Great little video depicting the falling snow conditions as you photographed a scene. After 4+ drought years with little or no snow, these photos make up for it all. Makes we want to drive the 1.5 hours to YNP just to flop down backward and create snow angels! Thanks for making the trek. Hope you like these photos as much as I do! Thanks Ann – I’ll pass that on to Claudia. You should definitely get up to the park, since you’re so close. I’m delighted (but SURPRISED) to see these images, and the explanations of technique are terrific and appreciated. Surprised, though, because I recall hearing that you live in Mariposa, and isn’t Hwy. 140 closed these days? I ask, somewhat selfishly, because I’d love to head to the Valley from here in Nevada Co. sometime soon! Thanks! Thanks Ron. These photographs were made on Wednesday, and Highway 140 closed on Thursday morning. It’s open again now. I second the prior post, thanks for the great technique information. I am heading up to Yosemite early next week and appreciate having your examples to use as reference. Hopefully it will snow while I am there and can put the info to good use. I particularity like Oaks, cedars, and falling snow because the slow shutter speed gave the photo a good sense of motion. My wife and I arrived in Yosemite Valley during the afternoon of this very storm. Little time for photography. The next morning was spectacular! We tromped through the snow west along the South side of the Merced River across from Yosemite Lodge. We were heading for our favorite spot along the river where we can turn around and look back east from were we came. A magnificent view appears: river view in the foreground with North Dome and Half Dome in the background. The scene was absolutely amazing! I’m sure you’ve shot from the same location many times. This view during the fall is also fantastic. P.S. Did you return to Mariposa before the rock slide? Or, did you have to drive around? We stayed in the Valley until the morning after the slide was cleared, today, which is Sunday. We live in Modesto. Alyn, I’m glad you got to be there for the snow – that’s great. Yes, we returned Wednesday afternoon, and the rockslide occurred early Thursday morning. We were actually on our way back up to the valley Thursday morning and ran into the road closure, so we had to turn around. 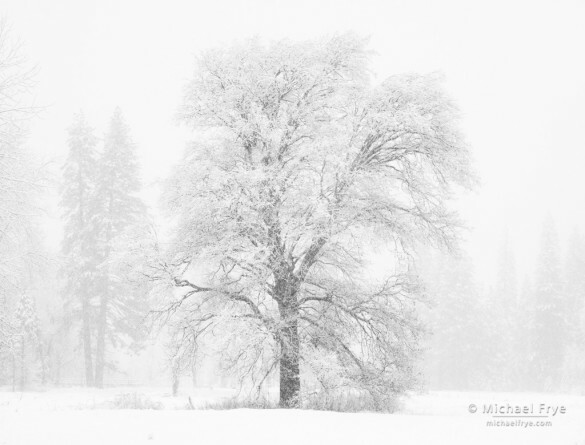 Your snow images are beautiful, depicting the the quiet inspiration of Yosemite, even when cold and snowy. Unfortunately, the video would not play for me. It says . . . . “due to privacy settings” I am unaware that I have such settings. It would indeed be fun to see you at work, without noticing. A couple days ago, I accessed the Yosemite webcams, with fresh snow. One cam scene showed a single photographer alone, out in the Ahwahnee Meadow with his tripod at dusk (during snowfall) getting his shot toward Half Dome. There were just his tracks in the snow. It really made me smile! I am so jealous that you live close enough to make quick trips to such a glorious scenery, but then . . . you share your captures with us!! I have difficulty taking photos in the snow, so I am happy to have your tips from experience. Thank you! Julie, it’s odd that you can’t view the video. The privacy settings for it are set so that everyone can view it. It might be something in your Vimeo settings, but I’m not sure. It’s also possible that it’s just some glitch that can be solved by restarting your browser or computer. Aren’t the webcams great? 🙂 It’s fun to see people on them. As always, great images which convey the mood of winter. As for the video – if you were standing behind a view camera I would have mistaken you for Ansel Adams! You’re welcome Frank, and thanks. I thought I did do a book along those lines, called Digital Landscape Photography. 🙂 But maybe you’re thinking of something different. Love those big fluffy flake snow storms when there is not much wind! Really nice shots. Really nice shots, thanks for sharing! Winter wonderland beautiful images. We are having our first snow of the season in Ohio. About 3 inches so far. I better get my long johns on and head out too. Thanks Terry, and I’m glad to hear that you’re getting some snow back there. Thanks for responding to my earlier comment. It’s greatly appreciated. Question: Have you worked up a schedule yet for your 2016 workshops? I’d be interested to learn what you have planned for Yosemite, particularly if you have one scheduled for the fall or winter, or maybe in the high country sometime during the summer months. I look forward to learning what you have planned. Alyn, you’re a subscriber, so you should have received an email on 11/21/15 with a link to the 2016 workshops. Very nice. Love the video as well hope all is well. Thanks Larry. Things are great here, hope all is well with you. I only became a subscriber recently. Therefore, I missed the email to which you refer. I’d be most pleased to receive it. Alyn, I forwarded that email to you. I love these snowy scenes! Yosemite is so magical as is, and then a snow storm just bumps it up to 11. I will have to keep in mind using a longer lens with deeper hood and to stand underneath some shelter to get a little clear distance for the falling snow. Great tips as always. A couple of years ago, I had the chance to photograph at the Chicago Botanic Garden during a snowfall (it is great they are open year round, even in winter). The bonus was fewer people. Those are some of my favorite images from that place. Sorry if you have already answered this, but would you mind letting me know what lenses you use with your Sony a7RII to capture your fantastic images? Well I probably have mentioned this somewhere, but I have a Canon 70-200 f/4, a Canon 17-40 F/4, and old Nikon 50mm f/1.8, and a Rokinon 24mm f/1.4. But I would not recommend most of those lenses for anyone else. First, the Canon 17-40 is crap – I rarely use it. And I’ve tested several copies, and they’re all equally bad, if not worse. My 70-200 is excellent, but I’ve tested three other copies of this lens, and none were very good, so it’s a crapshoot. The Rokinon is really the only one I’d recommend, as it’s excellent optically, and inexpensive. It’s a good lens for night photography, and popular with night photographers for that reason. But it doesn’t have any electronic connections to the camera, so no autofocus, no automatic diaphragm, and not even any lens EXIF data.